China successfully completed on Monday the country's second space docking that linked the unmanned spacecraft Shenzhou-8 again with the prototype space lab Tiangong-1, according to the mission's control center. About half an hour before the re-docking, Shenzhou-8 had disengaged from Tiangong-1 after a 12-day flight together. Shenzhou-8, launched on November 1, rendezvoused and docked with the target orbiter Tiangong-1 on November 3rd in an orbit 343 km above earth, marking China's first space docking a success. Tiangong-1 has been in orbit since its launch on September 29. The Beijing Aerospace Control Center (BACC), which commanded the Shenzhou-8 mission, called the re-docking a success, during which functions of the measuring equipment and docking mechanism were tested in solar light. Following the re-docking, the coupled spacecraft will fly together for two more days before the scheduled return of Shenzhou-8 to earth, Wu Ping, spokeswoman for the manned space program, said earlier. The BACC said Monday that after the successful docking tests, the center will further modify the parameters of the orbit for Shenzhou-8 to return based on data collected through close monitoring over the procedures. 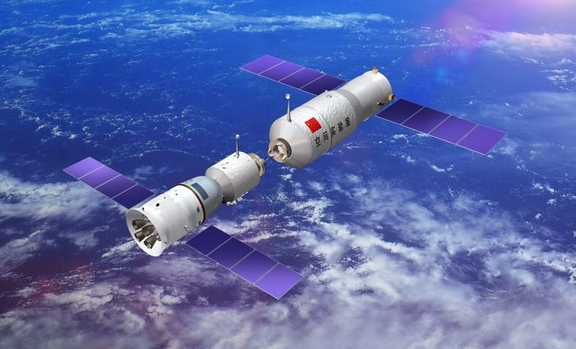 China has also established a management body for the orbiting space lab. The orbiting module management will include taking care of the space lab, making preparations for any further docking tests and gathering experience for building a future space station. The committee will deal with operations planning, technical appraisal and flight control of the target orbiter after the unmanned Shenzhou-8 spacecraft returns to earth after its mission, the official website of China's manned space program said. The operation committee for Tiangong-1 heralds China's manned space program entering a new phase for lengthy flight missions, Niu Hongguang, director of the operation committee, said. The orbiting module management will include taking care of the space lab, making preparations for any further docking tests and gathering experience for building a future space station, Niu said.